If you get into ultralight backpacking, at one point or another you will come across one company name, usually abbreviated. MLD. Mountain Laurel Designs. Its at the moment probably the company with the most demand on its products, leading to waiting times of up to four weeks, sometimes even more. Using MLD gear seems to be like wearing a Levis 501 back as I was a teenager, you're "In". And for good reason: High quality materials and superb craftsmanship, paired with a owner who knows UL like the back of his hand, coming up with fresh designs and innovations equals a winner. Ron Bell is the Design Minister at MLD, and he took out some time of running the business and answered my questions (probably that means some order will come a day later ;). I started sleeping in the woods as a little cub scout. I’ve probably slept outdoors about 900 nights since then - once for a whole year in a tent in Yosemite. 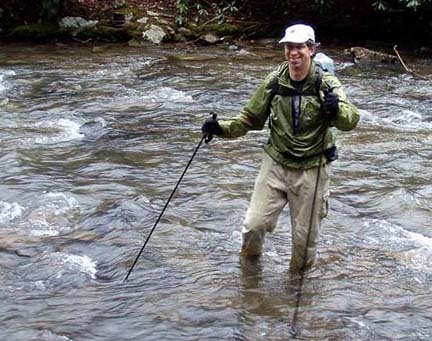 I get out into the woods about 100 days a year now - mostly on day hikes, trails runs, and for mountain biking or paddling and most of my overnight backpacking trips are with my daughters - we love weekend overnights on the Appalachian Trail. Ron out on the trail. I was always interested in lightweight gear and started MLD as a hobby in about 2000. By 2005 I was making more and more products and in in 2006 it became my full time job. 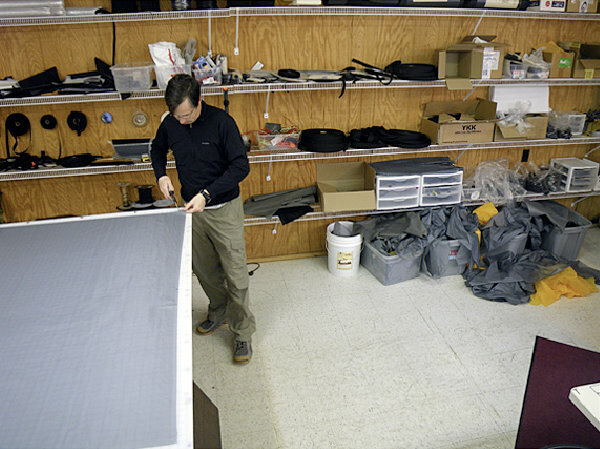 In 2007 we opened a larger shop, trained craftspeople, invested in a lot of equipment for UL materials and worked with fabric suppliers to help develop UL fabrics for our products. We’ve still fairly small and still have fun in the shop building the gear. Mountain Laurel Designs is currently by many considered the leading SUL cottage manufacturer, due to the highest level of craftsmanship and very innovative products like the DuoMid, Grace tarps and the Soul Bivy, among others. Can you tell a bit about how you decided to start Mountain Laurel Designs, and how it developed since you started? A lot of gear started with ideas and great feedback from customers and various outdoor athletes that use MLD gear - we are blessed to have awesome customers. Our 2010 SuperPack series was inspired by custom orders over the years from hikers and climbers who needed sub 1lb UL super tough packs for Alaska bush whacking and for Everest climbs (a 10oz pack summitted Everest!). We are unique in the cottage UL gear community. We design and build all our gear in our shop and offer gear in all the major gear categories with lots of options in each category. For example - our Superlight Bivy is offered in three colors, two sizes, two zippers sides and two mesh hood options - That’s over 20 different combinations for just one product - not even counting the special orders. If you add up all the products with just the standard options we offer, we have well over 400 products! The only way we can do that is to build all the gear ourselves in our own shop. 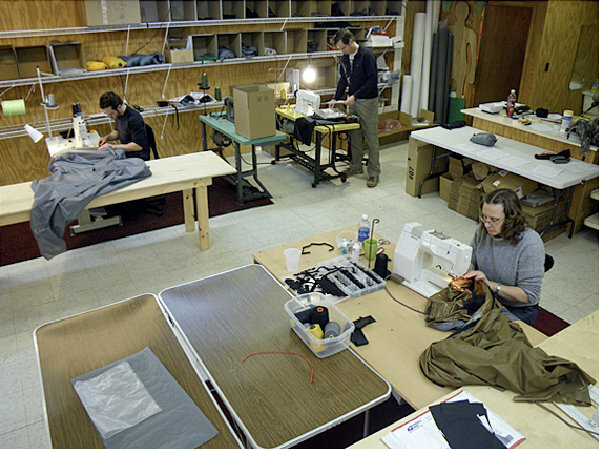 We’re owner operators - we design the gear - use and test the gear and craft the gear. How works the R&D at MLD, do you have a need yourself that you try to fix, or do some of your clients inspire you for new products or ask you for solutions to their problems? We are always looking for ways to make the best gear. We just finished testing a new 20d X 20d PU blend coated shelter fabric that weighs about 1.25oz sq/yd and is more waterproof than most Silnylon (about the same as our new Shield Silnylon). Well... It stretched too much for anything other than small tent panels and so would not work well for tarps and Mids - so that fabric is a no-go but but we gained valuable information on sourcing other fabrics next year. We have many new designs planned for 2010 - Stay Tuned! How easy, or difficult, is it to compete versus the mass market manufacturers? Have they maybe already tried to approach you and buy the company? It’s easy to compete with the mass market - offer unique products, continually innovate and stick to excellent personal customer service. We get approached sometimes for partnerships, etc. but I love my work and have no plans to sell - There are too many new designs and product improvements I want to make! What kind of new innovations can we expect in the next years from Mountain Laurel Designs? It’s important to try new things and we are always looking at new designs and materials. I worked with the DuoMid for 3 years trying it out myself in the field before we offered it as a product. The new SoloMid in Shield Silnylon, Spintex and Cuben will come out in spring and the updated Dyneema X packs. Got to love the look of this busyness! I don’t have a One favorite. It depends on the trip but usually it’s whatever I’m prototyping at the moment. So it's a protoype sub 10oz pack and the SoloMid this week. More and more people will are trying to get outdoors. The last decade saw a shift towards front country sports and less in-the-woods trips but I feel that is changing back. People want to get out in the woods and gain some sense of peace with nature. They don’t always have much time so the UL approach is one way to get out farther and see more in one weekend. Are you the cooperating "behind the scenes" with other cottage manufacturers? Are you for example in touch with Brian Frankle of ULA Equipment, Glen Van Peski from Gossamer Gear or any of the other cottage manufacturers, and talking about developments and the like? I’m friends with some of the other small UL company owners and always look forward to seeing them at gatherings like Trail Days. But there’s not really any specific cooperation at the product or market level and that’s good for the consumer - we’re all working independently to make great gear and offer competitive choices. Occasionally we’ll talk about broad business issues that affect the UL industry as a whole like gear trends and the overall outdoor market. For example, in 2008 and 2009 I first spotted a huge problem with some the waterproof materials that I knew a few other UL companies also use in shelters and alerted others about the problem before they built lots of product with the leaky fabric. I cooperate with a few non-competing companies like thru-hiker.com, etc. on sourcing cutting edge fabrics. Overall, I think we all want each other do well because that means the UL movement is continuing to grow. Ron, I thank you for taking the time to answer my questions.